Ideal for creating a visual backdrop at conferences, product presentations and launches, Portable Exhibition Displays also adapt easily for semi-permanent promotion within showrooms, office and retail settings. With roots in large format print, and the design and manufacture of free-standing signage, it was a natural step for Signwaves to add portable exhibition displays to its offer almost 20 years ago. Very similar product design and functionality challenges apply to a hardware range that needs to be quick and easy to assemble or erect, robust and transport friendly, and importantly must display beautiful stand-out graphics in the best possible light. The striking and cost effective Curved Pop-Up is based on a spring tensioned lightweight expanding aluminium frame with a set of roll-up graphic panels that suspend on the frame and neatly join and align with the aid of magnetic edging and clip-on support rails. 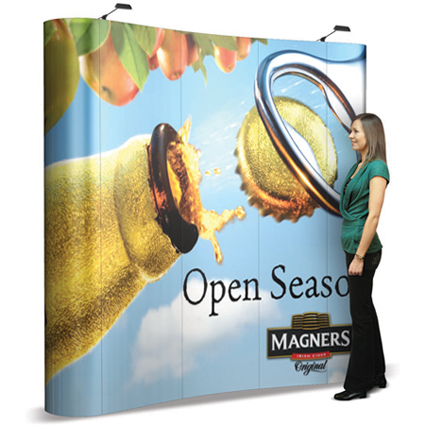 Up to 3.2 x 2.3m in 2 size options one person can erect this impressive visual back-drop in less than 15 minutes. It comes complete with a pair of clip-on halogen spotlights and soft wheeled trolley case, or a hard trolley case is available separately which, with optional folding table top and graphic wrap, doubles up as a practical presentation counter with handy storage space inside. Signwaves banner stand offer covers everything the majority of customers will be looking for in an internal vertical banner display. The X-Banner stand is the lowest cost solution displaying a 600 x 1600mm eyeleted banner within a lightweight folding cross-frame, with carbon fibre poles keeping the banner tensioned in both directions. The single or double sided Quick Banner is similar to X-Banner but clamps a non-eyeleted banner, or back to back banners, along the top and bottom edges whilst a supporting pole can be adjusted to perfect the tension. Roller Banners, or Roll-Ups as they are sometimes called, are very popular and come in a number of styles and sizes. Operating like an upside down roller blind, a printed banner is stored on the roll in a spring tensioned aluminium cassette and then simply pulled out and supported on a lightweight aluminium pole when in use, with a folding foot or feet providing stability. Signwaves offer 3 roll-up designs. Eco Roll-Up and the Budget Roll-Up are both low cost hardware solutions for one use banner display, but the Budget Roll-Up in particular is of a quality and design that belies its name and price-tag. Available in 600, 800, 850 and 1000mm stock banner widths the stylish square sided silver casing and single black moulded nylon foot epitomises design minimalism at its best and puts many much more expensive roll-up offers to shame. e common 800 and 850mm width options. All Signwaves roller banners take less than a minute to either assemble or take down and a black canvas carry bag, included with each unit, provides compact storage and protection when not in use. Promo Stands and Promo Counters are a must have for events and within retail environments for product sampling and tastings. Easy-clean countertops display product samples or literature, and extras can be stored in the spacious shelves beneath. The lighter weight all plastic Promo Stand, with high visibility header panel, is designed for catching attention at events, exhibitions or in shopping malls. Both products are flat-pack and surprisingly portable. 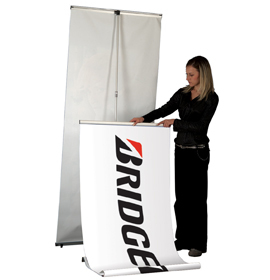 Promo Stand is supplied with a black carry bag which is an optional extra for the Promo Counter. Top Tip – use multiple Roll-Up banners butted up in a line with a spliced print to produce an eye-catching Banner Wall. The small gap between each banner doesn’t detract from the overall visual impact, width is unlimited, it is quicker to erect than a pop-up - and cheaper too!